Is very sturdy and reliable. It is set it up and forget it. Our son has a patch on every shirt. He always wears shirts. If he were to be lost he would be able to be iD’d from this wearable iD. We have a wide array of products for people with different sensory needs. Many people do not want to stick out so much when at school or in everyday settings so our shoe tag would be more subtle and helpful for them. Other people might not wear clothing and run away when naked. Our temporary tattoos can help them. We also have things for high functioning people such as dog tags, keychains, and iD cards that they would choose to show only when they are having communication issues such as being pulled over by the police or getting on the wrong bus and not being able to communicate from the unexpected real world situation. Our products are very affordable. Average cost for wearable id is typically only $10 to $15 with no fees. All information can be updated in real time by the caregivers as the situation changes. There are two parts to our free registry. The public profile, and the confidential question and answers section. Public profile: This is the part of the registry that would be visible when scanned or entered on the website. We tell people to not use last names, or addresses and to only put the information they would be comfortable with having a finder know to help their loved one in a critical situation. This can be updated in the moment. Confidential question and answers: The is the personal information of the user. It is caregiver controlled and not seen when the wearable code is scanned or entered on the website. 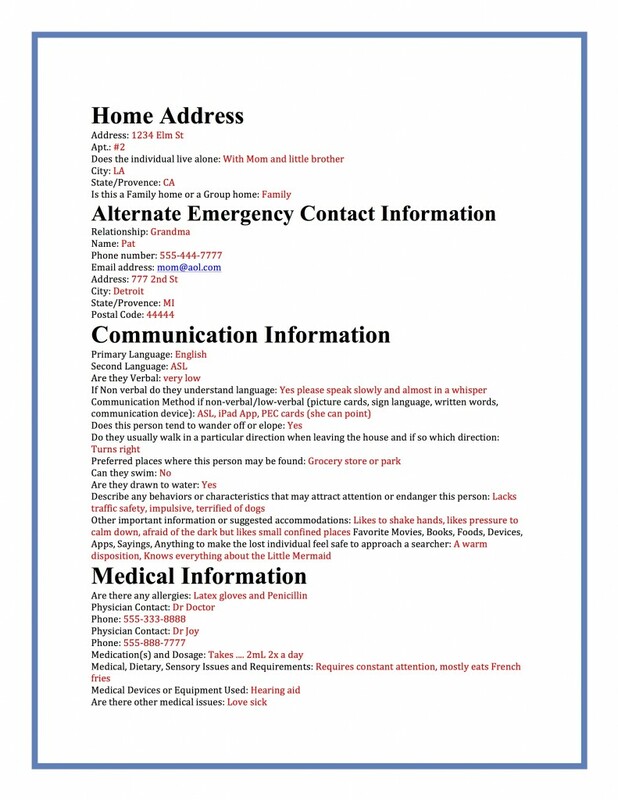 This is the type of information that first responders would need to know in a critical missing and can be updated in real time by the caregiver. The caregiver would have to either print or email to whomever they decide to share it with in an emergency. This information could also be shared with our growing national police network if the caregiver chooses to opt in. It would be very difficult. To scan a stranger would be very visible and stand out like a sore thumb. They would need to get within inches of the code on the wearable iD. Most of the people that are vulnerable to this would be low functioning and would always be with a family member or aide. If not with an aide the wearer is lost, in danger, and needs a finder to have the information to help them and get them home safely. As a parent of a child with autism the chance of my child being helped in an emergency by having this information available far outweighs the very low likelihood of it falling into the wrong hands. Yes. Our 15 year old son Jay has been receiving ABA for almost 11 years. Even though he has always improved with therapy it took almost this whole time for his elopement risk to greatly diminish. He or others like him could die or be greatly harmed while waiting for the behavioral elopement goals to be met without wearable iD. Also, what if they are in the community and get separated from their caregiver by accident. With intense speech therapy Jay has gone from nonverbal to low verbal while this is life changing in itself he still cannot really communicate in an emergency. The main time he was lost he was not trying to elope. At 6 years old after drop off at school his aide forgot to bring him inside with the class. He was standing by the fence scared to death. Anything could have happened to him. A mom passing him knew who he was and brought him inside. We were lucky and as a result started If I Need Help. People with physical issues such as Epilepsy, Diabetes and other issues that hinder them from being able to self advocate during a critical moment are also using this system. 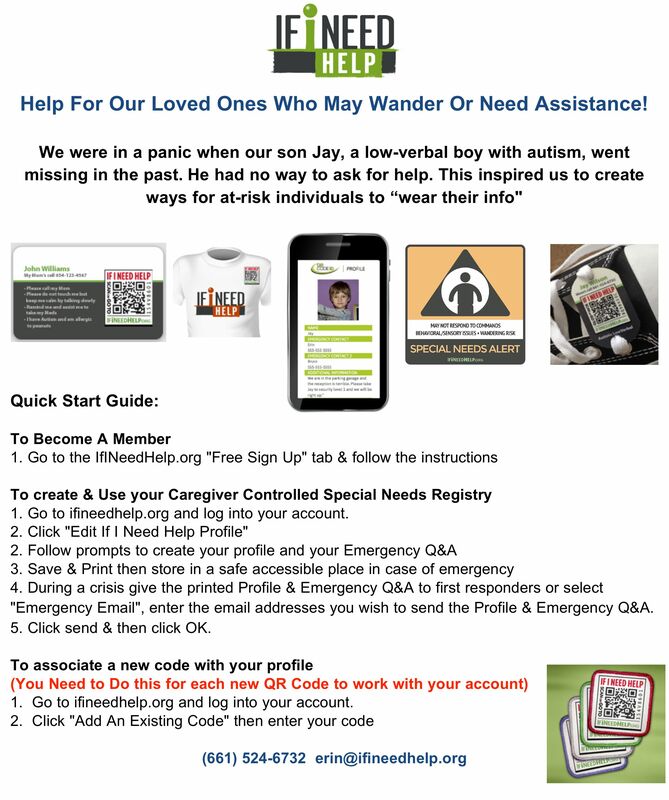 100% free caregiver controlled profile with picture, contact and emergency info. This information is editable in real time as life happens. Emergency Q&A This information can contain all a first responder would need such as picture, height, weight, can they swim, are they verbal, do they have a diagnosis, medications taken, special accommodations etc. freeing the caregiver from having to remember all the important details during the pressure of a crisis. Emergency email that can send the user profile with picture and emergency Q&A to first responders in the need of a search or other critical situation. Wide assortment of wearable iD products and other safety products often utilizing QR technologies with text linked to a unique user profile. The wide variety of products are designed so there will be an appropriate iD product for everyone no matter their sensory needs. When a wearable iD’s code is scanned or manually entered on our website the member’s profile can be accessed by a finder and the person in need can be helped and returned home. During a search or other event by logging into our website and pressing the “emergency email” the members profile, and extensive Emergency Q&A form will be emailed to whoever the user needs to send it to. We offer free memberships to people who might become lost, disoriented or unable to self advocate when alone or away from their caregivers. Our members are generally people with Autism, Down Syndrome, brain Injuries, diabetes, seizures, Alzheimer’s, dementia, intellectual and/or developmental disabilities and other similar issues. This works everywhere there is internet access both domestically and internationally. Identification and information is extremely important for a person who is lost or unable to communicate. It can help save a life. Wandering is the only cause of death due to Autism. 60% of people with Alzheimer’s wander. A person having a Seizure or other physical condition often can’t tell anyone who they are or how to help. IINH is looking to increase our free membership. You can help with networking, donating, sponsoring, volunteering, grant writing, and partnering. A five year old non-verbal boy with Autism was with his family in a giant packed park for a soccer tournament. After each match the teams, and families would pack up and move to another field for the next match. During one such move the father thought the mother had the child and vice versa. After the move to the next field both parents realized at the same time that the boy was with neither of them. Their hearts jumped out of their chests and in a panic they started to run. 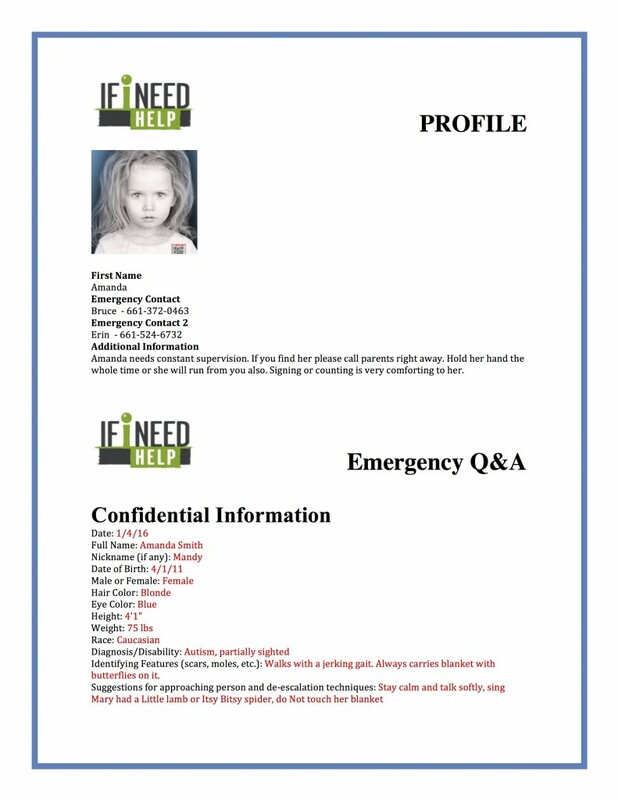 Just then they received a call from a person that had found their child in another part of the park, and scanned the If I Need Help patch the child had been wearing on his shirt. He was back with his parents in minutes. If I Need Help might save your child’s life! “If I Need Help” products just might save your child’s life! It had been such a great day! My son and I had just left a friend’s house and we were headed to McDonald’s. The light turned green and I pulled into the intersection to turn left. My son, Matthew, was sitting in the back seat singing “The Wheels On the Bus”. My next memory was being slumped over in my car, crying out in pain, staring at my own blood splattered on the dash. I couldn’t hear my sons voice. I later learned that a young woman was talking on her cell phone and ran the red light. She was going at least 40 mph and her car t-boned into my door. 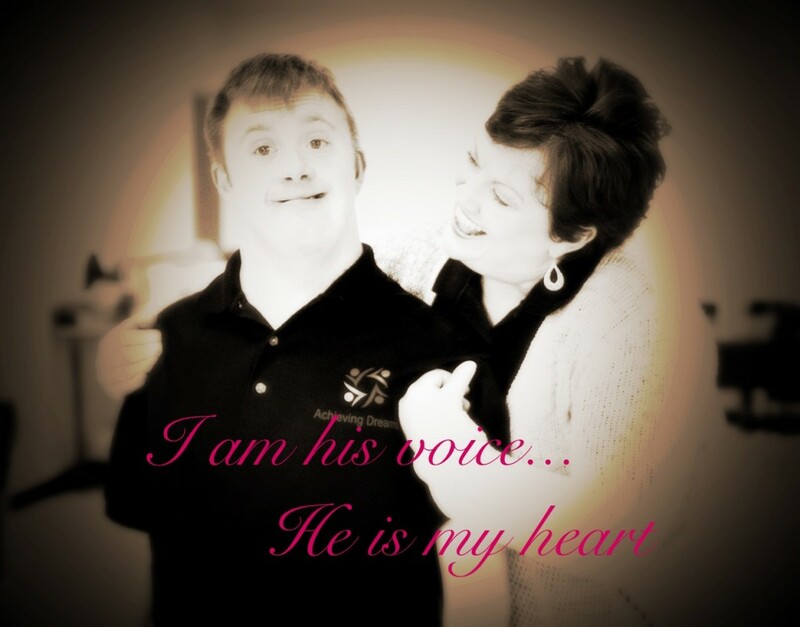 My adult son has down syndrome, autism, and is non-verbal. I was terrified that he might be injured, or worse, but then I heard his voice and a sense of calm came over me. He was alive and that’s all I needed to know at that moment. Though I was incapacitated I was alert enough to know that he would need special care because he wouldn’t be able to communicate if he was hurt. Finally, after what felt like hours, two young men arrived. One of them got Matt out of the car, and to a safe place, while the other comforted me until help arrived. It took about 30 minutes to remove me from the car and into an ambulance. I received 9 stitches in my head and Matthew, thankfully, was unhurt. Though Matthew was pulled from the car and was safe, no one knew anything about him. What if he had a meltdown, had medical issues or was hurt and couldn’t communicate it to anyone? They didn’t even know his name. I seriously considered designing a product, with a national data base, that could easily identify children and adults with special needs in case of an emergency. I never got to it but someone else did and I am so honored to recommend “If I Need Help”. “If I Need Help” is a company that was founded by Bruce and Erin Wilson. Their autistic son disappeared several times, causing fear in their hearts, and they knew something needed to be done. Please share on your page so others will know!